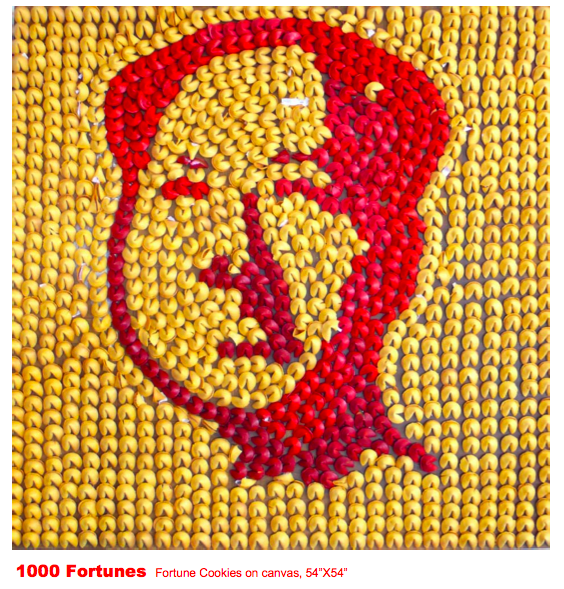 Benjamin Wallace (author of the forthcoming book The Billionaire’s Vinegar) passed me this amazing artwork by Robert Deckey (his artist brother-in-law who apparently doesn’t have a Web site that I can dig out) — a portrait of Mao Zedong made out of hundreds of fortune cookies. its indifference to human rights and intellectual property laws. Fortune cookies are an American invention to inspire poor Chinese immigrants to work harder and have hope. The artist is American and was born in Rhode Island. He began making artwork at 5 when he attended a summer camp run by RISD students for children of professors, where his father taught. Robert has a bachelor of arts from Brown University, a masters from the University of Pennsylvania, and has studied painting at the School of Visual Arts and the Art Students League in New York City.